Deception is rife in nature, from spiders that mimic ants for protection through to carnivorous plants that lure insects with attractive smells. As highly visual animals ourselves it’s only natural that we humans often judge the appearance of other species through our own senses. However, if we want to understand how animals communicate with one another, and how they are exploited by others, we need to get inside their minds, or at least their sensory systems. Nature is full of bright colours and patterns, but how different animals see the world varies substantially. Humans (with ‘normal’ colour vision) see colours by comparing the responses of three types of cell in the eye, called cones. These are sensitive to shorter (‘blue’), medium (‘green’), and longer (‘red’) wavelengths of light, and provide us with trichromatic vision. Other animals don’t see colours in the same way. Many mammals like dogs and cats have just two cone types and are dichromatic – they can’t discriminate between colours that we see as red, green, and yellow. On the other hand, most birds are probably tetrachromatic and see colours with four cone types, including one sensitive to ultraviolet (UV) light, to which we are blind. There exists considerable variation among invertebrates too. In short, our interpretation of the world is a construct of our sensory systems and brain. A European crab spider Synema globosum matching the colour of the flower it sits on waiting for prey to come near. In Australian crab spiders, some species lure prey not through camouflage but with bright ultraviolet colours. Photograph by Martin Stevens. Do not re-use without permission. To appreciate how deception works, we need to know something about how the exploited animal perceives the world. Crab spiders provide a nice example. Many European species match the colour of the flowers they sit on, and through their camouflage wait for unsuspecting prey to come close. Australian crab spiders don’t follow this pattern, however. If we image some of those species under UV light, they glow and stand out like a beacon. Why they do this is revealed in understanding the vision of many pollinating insects, such as bees, who have excellent UV vision. 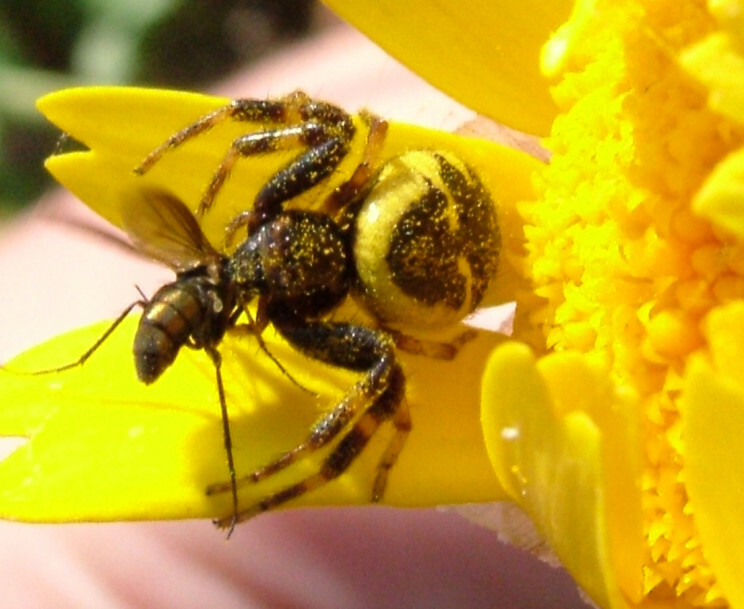 The crab spiders lure pollinators towards them with attractive bright UV signals. The flip side is that understanding vision can also shed light on why deception to our eyes doesn’t always seem impressive. For example, some Cryptostylis ‘tongue’ orchids lure one species of pollinating wasp without providing any reward (no nectar). Specifically, they attract male wasps who are tricked into ‘thinking’ that the flowers are a female, with which they try to mate. To us, the resemblance is not especially good, either in colour or pattern. However, wasps have a visual system that is poor at seeing red colours and their compound eyes are not very effective at resolving fine detail in shape and pattern. Research, modelling the vision of the wasps, has shown that to their visual systems, the mimicry by the orchids is actually very effective. Understanding how vision works can also shed light on how signals evolve to exploit the behaviour and responses of other animals. In the ancestors of some modern primates, including humans, colour vision underwent an evolutionary change from a dichromatic state to trichromacy. One of the major reasons seems to be that trichromatic vision enabled individuals to detect ripe red and yellow fruit from a backdrop of green leaves, something that isn’t easy for dichromatic mammals. 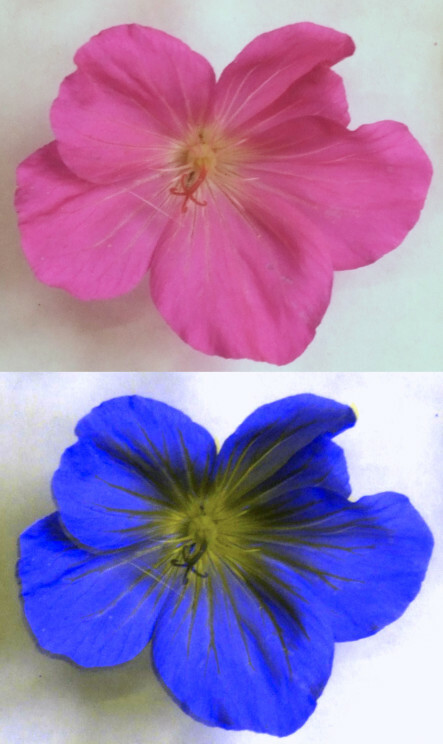 A flower seen through human vision (top) and represented to bee vision (bottom). Photograph by Martin Stevens. Do not re-use without permission. Subsequently it seems, many of these trichromatic primate groups evolved red faces and other red signals in mating and dominance interactions because they elicited a greater response in the visual system of mates and rivals. So red signals in these animals arose because the ability to see red had already evolved for another function. Deception is far from limited to vision. It’s common in other sensory modalities too, such as hearing. Over millions of years bats, many of which hunt by broadcasting high frequency ultrasonic echolocation calls, have exerted considerable selection pressure on insects. The frequency of these calls is well beyond our natural hearing range. In an evolutionary arms race, as bats have evolved increasingly specialist echolocation skills, insects have evolved a range of defences. One of these is hearing organs, which have arisen multiple times independently in many insect groups. These ears have in many cases evolved to detect the ultrasonic calls of bats, so that the moth, for example, can take evasive action. A major development is that, just like with the red-faced primates, hearing and sound production has also been adapted for other functions like mating, and often in a deceptive manner. Work by Ryo Nakano and colleagues has shown that some male moths produce ultrasonic courtship songs that are highly effective at stimulating female hearing. When they prevented males from making their songs, mating success declined considerably. However, when the muted males were accompanied with playbacks of songs through speakers, mating success was restored. This was not the case when playing white noise instead. The remarkable thing, however, is that in one experiment, with a moth called the common cutworm (Spodoptera litura), when the scientists played back bat echolocation calls, male mating success was also effectively restored. Over evolution, female moths evolved a freeze response for when they hear ultrasonic bat calls, and the male songs exploit this by causing females to pause, essentially preventing the female from running away. Interestingly, in other moths, males produce calls that cause rival males to freeze too. All in all then, deception is in the sense of the beholder, and without understanding how other animals perceive the world we often can’t appreciate how deception has evolved and works. Featured image credit: Bonnet Orchid – Cryptostylis erecta, by David Lochlin. CC-BY-2.0 via Flickr. Martin Stevens is Associate Professor of Sensory and Evolutionary Ecology in the Centre for Ecology and Conservation at the University of Exeter. He has authored many research papers, in addition to two textbooks. 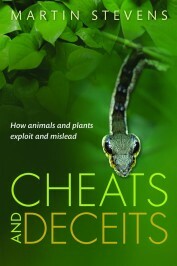 His latest book is Cheats and Deceits: How Animals and Plants Exploit and Mislead (OUP, 2016).